While surfing on social site facebook I came across a post by my friend. As it was related to accounts and taxation it caught my attention immediately. I decided to share it. But It looked me familiar. I am sharing this with you. It is said that If you are born then start paying the taxes and pay until you die. Taxes are eternal truth. A troll about taxation system in India is moving on Facebook for quit some time and Now One of my Facebook friend Chinmoy Das again shared it to me. I am putting it to my readers. Enjoy and give your valuable comments. Many people feel that if they are not paying Income tax then they are not paying any tax but they are living in a myth that they are not paying tax. Govt. is silently slipping penny out of their pocket and they don't even know how and when. but If you are doing business India which is hardest task then all most all taxes are applicable on you depending the level of business you are doing and kind of business you are doing. Here is the troll for you. ☑ 1) What r u doing? Tax : PAY: PROFESSIONAL TAX! ☑ 2) What r u doing in Business? ☑3) From where r u getting Goods? Tax : PAY CENTRAL SALES TAX, CUSTOM DUTY & OCTROI! AND NOW LBT & LPT. ☑ 4) What r u getting in Selling Goods? Tax : Pay DIVIDEND DISTRIBUTION TAX. ☑ 5) Where u Manufacturing the Goods? ☑ 6) Do u have Office / Warehouse/ Factory? ☑7) Do you have Staff? Tax : PAY STAFF'S PROFESSIONAL TAX! ☑ 8) Doing business in Millions? 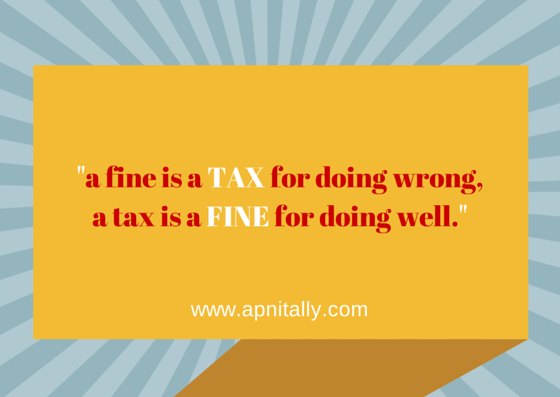 Tax : Then pay Minimum Alternate Tax (MAT). ☑ 9) Are You taking out over 25,000 Cash from Bank? ☑ 10) Where r u taking your client for Lunch & Dinner? ☑11) Are you going Out of Station for Business? ☑12) Have you taken or given any Services? ☑ 13) How come you got such a Big Amount? ☑ 14) Do you have any Wealth? ☑ 15) After paying so many taxes ,to reduce Tension, for entertainment, where are you going? ☑ 16) Have u purchased House? Tax : PAY EDUCATIONAL ADDITIONAL EDUCATIONAL & SURCHARGE ON ALL THE CENTRAL GOVT. 's TAX !!! ☑ 19) Delayed any time Paying Any Tax? ☑ 20) Do you want growth of India.? Ans: Off course Yes . Pay electricity tax, water tax, education tax, & other taxes, which is used by defaulter people. ☑ 21) INDIAN :: Can I die now, i have paid all taxes and now nothing is left with me? Ans :: Wait we are about to launch the FUNERAL TAX. Now here is the post which i have published way back in July 2011. You would find striking similarity. It raises some questions to ponder upon. What we are doing on social media since july 2011 or even earlier ? Just pushing contents of others! How many of FB users are actually contributing to FB? How many are just content pushers? I think almost 99% people on facebook just push contents published by some few others. This percentage may vary but this is a fact. What do you think friends?